Ray Palmer has been slowly building his A.T.O.M. suit this season on Arrow as a tool to fight crime in Starling City. Although he drafted Felicity Smoak to help build it, we haven’t actually seen what it would look like aside from those holograms, and they’ve encountered a few obstacles with its construction in recent episodes. Fortunately, the CW has released the first image of Brandon Routh in the Atom costume, which he will put on for the first time in Episode 15, titled “Nanda Parbat,” which airs on Feb. 25. Take a look! 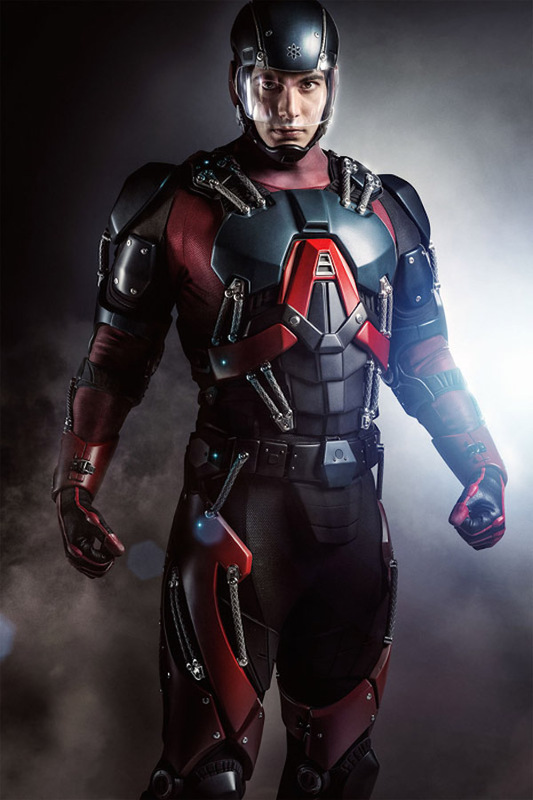 While The Atom costume in the comics looks more “superhero-y,” the live-action iteration emphasizes that Ray is wearing a powerful exoskeleton, and within the context of Arrow, it fits nicely. That being said, it’s wonderful to see that the show kept the trademark red and blue color scheme on the suit, specifically how the center sections were painted red to resemble the letter ‘A.’ Of course, I’d be remiss in not pointing out the atom symbol engraved on the helmet. It’s good to see Arrow remembering the character’s roots, as well as taking advantage of the building block of the universe aside from using it as an anagram (Advanced Technology Operating Mechanism). This thing is going to look awesome when we finally see Ray fighting crime in it. Last week, it was announced that Ray and Felicity would be appearing together in Episode 18 of The Flash. The duo will travel to Central City to get help from the S.T.A.R. Labs team with the A.T.O.M. suit, and while there help Flash and the team fight the Bug-Eyed Bandit. So while Ray will put the suit on later this month on Arrow, it’s a good bet that it won’t work at full capacity. He may look badass in it, but it’s not ready to be taken out on a test run in the mean streets of Starling City. Depending on the progress they make in The Flash, this could mean that we could get a team-up between Ray and the Scarlet Speedster out in the field rather than just hanging out in the lab. Although Ray has talked about the advantages of miniaturization as an offensive tool, it remains to be seen when, or even if, we’ll see him shrink down on Arrow this season. It’s been implied that like in the comics, the TV suit is also powered by a white dwarf star remnant, but that may be used for other purposes besides Ray making himself microscopic. Who knows, it may not even be on Arrow when he shrinks for the first time. That could be saved for The Flash (which is rampant with special abilities and unusual technology) or his rumored spinoff series. Either way, Ray is one step closer to his goal of becoming Starling City’s newest protector. You can catch Arrow Wednesdays at 8/7c on The CW.